In the current era of a neoliberal economic revolution and world-economic order, of globalisation, of a flat world (where the transport- and communication-technology revolution has wiped out all geographical advantage, compare (cf.) Friedman, 2009) and of a knowledge society, which is taking shape (that is a society where the driving-axis of economic development is the production and employment of new knowledge, cf. World Bank, 2002), the national education system is becoming an increasingly more important element of national power (cf. Symaco, 2012). Factors, such as the availability of natural resources, are becoming less-important determinants of national power. In order to remain competitive in this new international context, a nation is obliged to continuously take stock of the quality of its national education project (cf. Holik, 2013). One way to carry out such a measurement is to compare the national education system with other national education systems (cf. Wolhuter, 2011a: 37). In academic circles (among scholars of Education, social science scholars and researchers from other fields, as well as the managers of education, such as university rectors), and among business leaders, public opinion-makers (such as newspaper editors), teachers, learners, parents, students and the broader public, there is a widespread feeling that the South African education system is bad, or the weakest link in the chain tasked with uplifting society to its appropriate place in the world of the twenty-first century. This dissatisfaction with the education system reaches a crescendo each year with the announcement of the matriculation examination results; so much so, that with the most recent announcement, in January 2013, one renowned university rector stated that, because of the country's education system, he is ashamed of South Africa (Steyn, 2013:1). Analyses of the shortcomings of the South African education system tend to focus on one facet or part, such as parental involvement (cf. Mola, 2012); or extra private tutoring (cf. Anon., 2013: 1), without taking into account how that part fits in with the many other gears of the total education machine. This also applies to those analyses of a more academic nature (which are related to the academic imperative to specialise), as well as to the analyses of a more lay nature (which might be related to the superficial or naive nature of many such analyses). A systematic, holistic, comprehensive evaluation of the education system is missing. The aim of this research is to conduct such a comprehensive, holistic evaluation of the South African education system, by comparing the South African education system with education systems abroad. The article commences with a methodological explanation. A motivation for the choice of the international-comparative method is stated, and an enumeration of the available sources for such a survey is given. Subsequently, a theoretical framework is constructed, by means of which a comparison of the South African education system with those in the international spectrum could be done. As this comparison elaborates on and supplements the two existing taxonomies of national education systems found in published research, a summary of these taxonomies and an identification of their deficiencies are given - between the section of the theoretical framework and the comparative analysis - in the form of a literature survey. An evaluation of any national education system can take place by one or more of three ways. Firstly, the education system could be measured against the objectives/mission of that education system, as these objectives appear in official policy statements (legislation, ministerial or departmental policy statements, white papers, and so forth (etc.)). Secondly, the education system could be weighed up against the contextual demands (economic, demographic, social, political etc.) of the context in which the education system functions. Thirdly, the education system could be measured against international benchmarks. Existing international taxonomies of education systems: (Wolhuter, 1997, 2011b). The studies of the IEA, in which South Africa has participated, namely: the 2011-TIMSS; the 2011-PIRLS (Progress in International Reading Literacy Study); and the 2006-SITES studies. Data of the United Nations Educational, Scientific and Cultural Organisation (UNESCO) and of the World Bank, as well as the annual UNESCO report on the monitoring of progress toward Education for All (EFA). It appears as that the international education expansion drive, the motivations behind this drive, and the evaluation thereof, display three dimensions. The first is a quantitative dimension and this entails participation in education. As is clear from inter alia statistics published by UNESCO (2013) and the World Bank (2012), and standard publications on world education, such as that of Coombs (1985) and projects/ visions/goals, such as EFA and the Millennium Development Goals, this dimension is best measured by enrolment numbers and enrolment ratios at the levels of pre-primary education, primary education, secondary education and higher education, as well as by adult literacy levels (percentage of the adult population who are literate). Input quality: input quality refers to the quality of financial and physical (physical facilities and infrastructure) input. Process quality: this is the quality of teaching and learning taking place in the education project. Output quality: this is the outcome of the learning process, that is (i.e.) the achivement levels of learners at the end of the education process. Product quality: product quality refers to the effect of education - or the impact thereof - which the graduated product makes. One commonly used measure of this is, for example, to calculate the rates of return to education. As has been stated above, quality in education defies any simple, all-encompassing definition; and scholars tend to define it in terms of one only, or a few aspects thereof, on which their publication focuses (cf. Ntshoe, Higgs, Wolhuter & Higgs, 2010). A comprehensive model of educational quality, more recent than that of Bergman (1996) could not be found in the literature, although quality figures high on the Educational research agenda (cf. Wolhuter, forthcoming). Scholarly publications on educational quality still deal with one (or more) of the components, as distilled by Bergman (1996), i.e. input quality (e.g. 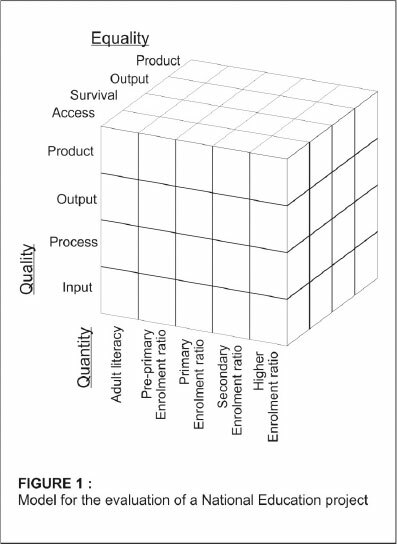 Jung, Wong, Li, Baigaltugs & Belawati 2011), process quality (e.g. Paris & Hamilton, 2009), output quality (e.g. Satz, 2012), and product quality (e.g. Iyengar & Bajaj, 2011). In the second half of the twentieth century, equality, in the form of equal educational opportunities came to the fore as the dominant motive for the expansion of education worldwide (cf. Wolhuter, 1993). This is a theme enjoying high priority on the research agenda of Educational research (cf. Wolhuter, forthcoming). The value of aggregate values or averages - indicating a high quality of education - becomes restricted when such values are determined by a numerically small elite. Indices of quality should, therefore, be qualified by a third dimension, namely: measures of equality. Equal educational opportunities is similarly a concept that is difficult to encapsulate in a single definition; and no concensus exists as to what exactly is meant by equal educational opportunities (cf. Wolhuter, 1993; Jacob & Holsinger, 2008). Equality of Access: the statistical chances that learners from various social categories could enter the school system. Equality of Survival: the statistical chances that learners from various social categories would reach a particular level in the school system (e.g. the last year of secondary school). Equality of Output: the statistical chances that learners from various social categories would achieve the same outcomes (e.g. pass the matriculation examination). Equality of Product: the statistical chances that learners from various social categories with the same educational qualifications would be able to obtain the same jobs, incomes and life opportunities. While a more recent model of equality, as comprehensive as Farrell's (1982) could not be found in the literature - even a volume as extensive as that of Holsinger and Jacob (eds.) (2008) eschews the construction of a model; and it rests its case by mapping the variety of paradigms by means of which equality in education is coneceptualised (Jacob & Holsinger, 2008). As in the case of quality, scholarly publications on educational equality still deal with one (or more) of the components, as distilled by Farrell (1982), i.e. equality of access (e.g. Wang, 2011), equality of survival (e.g. Anderson, 2012), equality of output (e.g. Rew, 2008) and equality of product (e.g. Darling-Hammond, 2010). The three-dimensional model for the evaluation of a national education project could be schematically presented, as in Figure 1. The first comprehensive classification, which was published in the field of Comparative Education, was the classification of 135 national education systems, based on a cluster analysis of the 15 indicators. 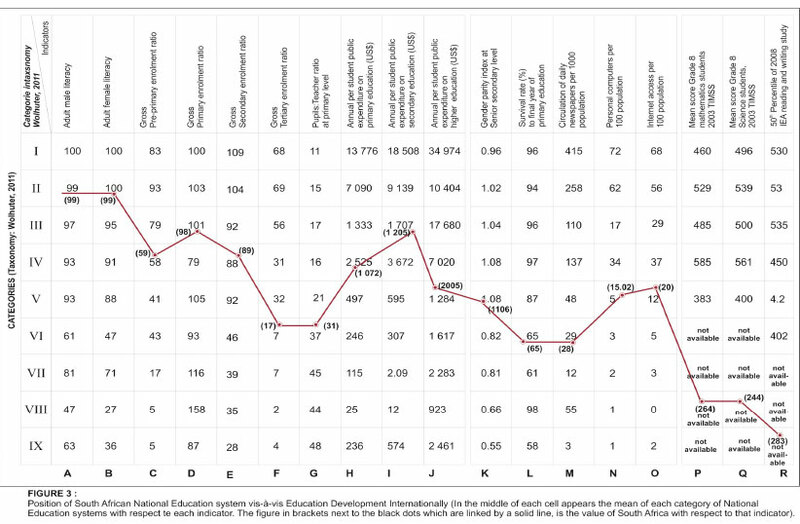 These indicators are conventionally used to describe national education systems, as published in the Comparative Education Review, 41(2):161-177 (Wolhuter, 1997). These 15 indicators were: percentage of adult population that are illiterate; percentage of adult males that are illiterate; percentage of adult females who are illiterate; gross pre-primary school-enrolment ratio; gross primary school-enrolment ratio; gross secondary-school enrolment ratio; gross higher education-enrolment ratio; annual per learner public expenditure on education (in US$); expenditure on education as a percentage of total governmental expenditure; percentage of public education spending allocated to primary education; percentage of public education spending allocated to secondary education; percentage of public education expenditure allocated to higher education; the learner-teacher ratio at primary-school level; the circulation of daily newspapers per 1,000 population; and the number of radios per 1,000 population. This analysis culminated in a rank-order of nine categories; and South Africa fell into category 5 (Wolhuter, 1997). In an ensuing publication, the above 1997 international taxonomy of national education systems was particularised to South Africa (Wolhuter, 1998). This particularisation was twofold. Firstly, the South African education system was broken up into its constituent parts: the (historically) White, Indian, Coloured and Black education systems. Secondly, the position of the South African education system (aggregate, as well as each of the four constituent education systems) with respect to each of the 15 indicators was determined. It was concluded that the (historically) White education/schools fell within category 2 of the international taxonomy, together with countries - such as Sweden, Australia and the United Kingdom (Wolhuter, 1998). The (historically) Indian schools fell in category 3, together with countries, such as Bulgaria, Chile, and the successor states of the Union of the Socialist Soviet Republics (USSR). The (historically) Coloured schools fell in category 4, together with countries, such as Portugal, Malaysia and Greece; while the (historically) Black schools fitted best in category 5, comparable with countries, such as Botswana, Turkey and Vietnam (Wolhuter, 1998). The second part of the particularisation was to calculate the values of the South African education system (aggregate, as well as each of the four constituent education systems) with respect to each of the 15 indicators, and to place them in the international spectrum of the taxonomy. From this exercise, it was concluded that the three largest problem areas in South African education were - besides the challenge of equalising the four constituent systems - the exceptionally low pre-primary school-enrolment ratio, the attrition between secondary education and higher education enrolments, and the low quality of education, which is obtained for the amount spent on educaton (Wolhuter, 1998). These problems could be graphically depicted, as in Figure 2. As is clear from Figure 2, the pre-primary school-enrolment ratios for each of the four population groups were, at that stage (in 1998), far lower than those of other education systems, when compared with most of the other indicators. Although this research was published in 1998, it was based on the data from 1993. For example, while White education was, with respect to most other indicators, comfortably in category 2 of the international rank-order, the White gross pre-primary education-enrolment ratio of 33 per cent in 1993 fell in category 5 of the international rank-order (to an average 22,3 per cent). With the exception of White education, the decline in enrolment ratios from secondary to higher education was much steeper than the international gradient (cf. Figure 2). If the learner-to-teacher ratio were to be taken as a measure of education quality, then the quality of education with respect to all the constituent systems was low, in relation to the level of education expenditure (cf. Figure 2). The next and the most recent taxonomy of national education systems, published in the international literature, was that of Wolhuter (2011b). This classification was also based on a cluster analysis of 146 national education systems on 15 indicators. Eight of the indicators were also in the 1997-taxonomy: adult male literacy, adult female literacy, gross enrolment ratio at pre-primary education level, at primary education level, at secondary education level, and at higher education level, learners-per-teacher ratio at primary education level, and the circulation of daily newspapers per 1 000 of the population. The annual public spending on education in US$ (1997 Classification) is now disaggregated into three indicators: annual public expenditure on education at each of the three levels of primary, secondary and higher education. Four new indicators, which did not appear in the 1997 Classification are now included, namely: the gender parity index at senior secondary school level; the survival rate to the last year of the primary school cycle; the number of personal computers per 100 population; and internet access per 100 of the population. Six indicators of the 1997 Classification were not included in the 2011 Classification, namely: the percentage of the adult population who were illiterate, public spending on education as a percentage of total governmental expenditure, the percentage of public education expenditure allocated to each of primary, secondary and higher education, and the number of radios per 1,000 of the population. This publiction of 2011 also included the statistics of the 2003 TIMSS and the 2003 IEA PIRLS studies, although not in the cluster analysis (because too few countries participated in these studies). 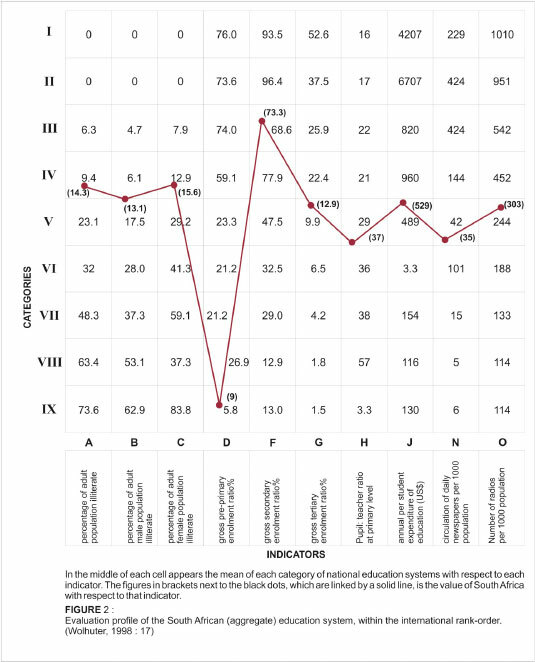 The cluster analysis once again culminated in a 9-category rank-order classification of national education systems, with South Africa again, as in the 1997 taxonomy, falling in category 5 (Wolhuter, 2011b). While at first glance, a comparison between the 1997 and the 2011 taxonomies creates the impression that South Africa has maintained its position in the international rank-order of education systems, at least three factors should be borne in mind. Firstly, the indicators on which the two taxonomies were based, are (as explained above) not identical. Secondly, a finer textured comparison of each of the 15 indicators should be carried out, as was done and shown by the particularisation of the 1997 taxonomy, described above. Finally, international (global) development in education between 1993 and 2011, with respect to each of the indicators, should be factored into the educational equation. Comparison between 1997 and 2011 taxonomies: international education development In Tables 1 and 2, the average values of each of the indicators for each of the nine categories, in the 1997 and the 2011 classifications, respectively, are presented. A comparison between Tables 1 and 2 shows the progress in educational development worldwide between 1997 and 2011. The pattern of adult literacy did not change much (large parts of the world were already by 1997 at or close to the point of universal adult literacy). The worldwide institutionalisation of pre-primary education is also surging ahead; although the gap between the lowest two categories of countries and the rest of the world remains huge. Gross primary school-enrolment ratios constitute a problematic indicator, because of the large numbers of over-age learners in schools in many countries (cf. Coombs, 1985); hence, the percentages exceeding 100 per cent in some of the categories in Table 2. With this reservation in mind, a comparison between Tables 1 and 2 still indicates considerable progress in the primary school-enrolment ratios between 1997 and 2011, especially in the case of those countries in the Global South. The top categories of countries in 1977 had already reached the level of universal secondary school education. By 2011, the middle categories of countries had also progressed to this level. While the lowest categories of countries showed a remarkable increase in secondary education-enrolment ratios by 2011, they are still far from the stage of universal or even mass secondary school attendance. It is, however, at the level of higher education where the biggest increases have taken place. The growth in higher education enrolments took place over the entire spectrum of countries (all categories), although the gap between the highest and lowest categories of countries has widened. According to the single measure of educational quality included in both taxonomies, namely, the learners per teacher ratio at primary school level, the global quality gap has increased. In the top categories, the number of learners per teacher declined between 1997 and 2011, while it increased in the middle and lowest categories. As was stated, South Africa falls into caterogy 5, right in the middle of the international spectrum, as captured in the 2011 taxonomy. When the position of South Africa with respect to each of the 15 indicators is analysed individually, this could be presented, as in Figure 3. As was the case in 1997, South Africa is still above the typical country in its category, when it comes to adult literacy. A noteworth improvement is that the country is now also above the typical category-5 country, as far as pre-primary school enrolment ratios are concerned. The 1997 pattern, of relatively high levels of primary school-enrolment ratios, followed by an exceptionally sharp decline in secondary and higher education enrolment ratios, is repeated. When secondary and higher enrolment ratios, and the learners-per-teacher ratio, are taken into account, the expenditure on education is high, and the returns are low. This evaluation is underscored when attention is paid to the 2003 TIMSS and the 2006 IEA PIRLS test results. It appears that the country does not get any real value for the money spent on education. What follows is a summative evaluation of the taxonomies discussed above against the theoretical framework (as constructed above), in order to determine the subsequent course of this research. The quantitative dimension is well represented, with gross pre-primary, primary, secondary and higher education enrolments present in both taxonomies. As explained above, the presence of over-age learners results in an overestimation of primary education ratios in many countries. The problem is that the data for the more reliable indicators of net primary school enrolment ratios are not so readily available for many countries. Even for secondary school enrolment ratios, this overestimation - when using gross ratios and the dearth of data for net enrolments - is a problem, although not to the same extent, as in the case of primary education. In the case of gross higher education enrolment ratios, the rise of lifelong learning (and the role of the university and other institutions of higher education in this regard) means that this indicator is becoming more and more an artificial construct. Even if the data for net higher education-enrolment ratios were readily available, this problem would remain. Some researchers use the indicator of number of higher education students per 100,000 population (for example Meyer, 2012); but currently, no international datasets exist for this indicator. The qualitative dimension is covered very poorly. The input component appears, as measured by the indicators of annual per student public expenditure on education (in US$) at each of the levels of primary, secondary and higher education levels, and by the learners-per-teacher ratio at primary school level. Other inputs, such as physical facilities, do not figure. The process and product components are not covered at all. Output quality is not included, although in the 2011 classification, it does appear as an add-on in the case of a limited number of countries. The equality dimension is covered even more incompletely. Only equality in survival is included, and then only in the case of one dimension of equality, namely, gender, in the 2011 classification (by means of the indicator gender parity index on senior secondary school level). All of the other dimensions of educational inequality, such as socio-economic descent, racial/ethnic status and geography, including the core-periphery gradient, rural-urban inequalities and regional inequalites are totally absent. Besides equality in progress, the components of equality in access, equality in outcome and equality of product, are also important. But these three are totally absent from both taxonomies. In the next part of this article, an attempt will be made to fill up these lacunae - and to arrive at an evaluation of the South African education that is as all-encompassing as possible, using international educational development as the yardstick. On the quatitative dimension, net enrolment ratios will be involved; and on the level of higher education provision, the conceptualisation of higher education as providing life-long education will be accommodated. In so far as the qualitative dimension is concerned, input quality factors other than financial inputs will also be involved, and the process, output and product-quality components will be included too. As far as equality is concerned, equality of access, of outcome and of product will be covered, as well as inequalities other than mere gender inequality. As explained above, pre-primary school enrolment ratios in South Africa have improved remarkably over the past two decades - from being the feet of clay in the country's educational body, to becoming relatively high. Gross primary school enrolment ratios are likewise relatively high. The net primary school enrolment ratio is 85 per cent (2010) (UNESCO, 2012). This is quite far below the 101 per cent gross enrolment figure (cf. Figure 3). Secondly, it is below the net primary school-enrolment ratios of other upper-middle income countries, such as Mexico (95 per cent), Argentina (100 per cent) and Malaysia (95 per cent in the 1999 most recent available figures) (UNESCO, 2012). Against the South African gross secondary school-enrolment ratio of 88 per cent (which is also relatively high, cf. Figure 3), the net secondary school enrolment ratio of 70 per cent is comparable with that of other upper-middle income countries: Malaysia (70 per cent), Argentina (70 per cent) and Mexico (67 per cent) (UNESCO, 2013). The comparison of gross higher education enrolment ratios reveals that South Africa is far below that of comparable countries (cf. Figure 3). When the numbers of higher education students per 100,000 of the population are compared, the picture does not change. In South Africa, there are 1 884 higher education students per 100 000 of the population, compared with 6,122 in Argentina, 3 620 in Malaysia, and 3 303 in Brazil (calculated from statistics in UNESCO, 2012, 2013). As far as the quantitative dimension of the comparison is concerned, South Africa has thus far not achieved universal primary school attendance; and is behind other comparable countries in the pursuit of this goal. Universal primary education is widely regarded as the absolute minimum level for a national educational project, as may be seen in the EFA initiative, amongst others. While net secondary school enrolment ratios are more comparable "with those of other upper-middle income countries, the 70 per cent figure in South Africa is still a long way from universal secondary school attendance; and in this regard, there is much scope for improvement too. It is, however, the relatively (compared with other comparable countries) higher education-enrolment ratios, which are a cause for concern, especially in view of the role of higher education in a knowledge-based economy and in a competitive global context. The particularisation of the 2011 international taxonomy of national education systems to South Africa above show that South Africa's per student public spending on education at primary and secondary education levels is higher than that of the average of other countries - falling in the same category as South Africa. At higher education level the spending is comparable with that of other countries, falling into the same category as South Africa. Learners per teacher at primary school level are almost 50 per cent more than in the typical category-5 countries (cf. Figures 2 and 3). It would appear that the South African population does not get value for the money spent on education. This statement could also be subtantiated by the statistics from the 2006 SITES study. This study inter alia (i.a.) measured which percentage of schools in each of the participating countries could supply computers to Grade 8 learners. Of the four upper middle-income countries, which participated in this study, South Africa was by far the lowest - at the bottom of the list. Only 38 per cent of South African schools could supply computers to Grade 8 learners, compared with 95 per cent in the Russian Federation, 99 per cent in Lithuania, and 96 per cent in Thailand (Law, Pelgrum & Plomp, 2008). The administrative substucture, as it is located in the South African case, in provincial education departments. The teacher factor: the knowledge, input and methods of teaching employed by teachers. The learners: the input by learners. As far as the administrative substructure is concerned, neither generally used indices (such as in the case of the quantitative dimension discussed above), nor internationally comparable datasets (also as in the case of the quantitative dimension) are readily available. Events, such as the ongoing textbook issue, and a constant stream of media reports create the impression that the administrative underpinning of the South African education system is not in order, and that this impacts negatively on the teaching-learning process in schools. For example, while there is a shortage of 15,000 teachers countrywide, five provinicial education departments are paying R2 billion per year to "surplus" teachers, whose posts have already been abolished (Govender, 2013:2). While the retail price of a loaf of bread was R7 in 2009, the national school feeding scheme during the same year, paid up to R27 for a loaf of bread. It is difficult not to ascribe the discrepancy, at least partly, between monetary investment in education, and input, pointed out in the previous paragraph, to an inefficient or dysfunctional administrative substructure. On the curriculum component, no obvious index exists either. Under the leadership of Aaron Benavot, a large collection and collation of information on secondary school curricula took place in the early 2000s. This project was commissioned by the World Bank and the International Bureau of Education. It culminated in a research report (Benavot, 2004) and a book (Benavot & Braslavsky (eds. ), 2007). However, this study and the various publications contained only information on the curricula; but included no evaluation. As far as the component of curricula in the South African case is concerned, it should be noted that the institution of Outcomes-based education and the accompanying Curriculum 2005 produced a very weakened product at exit level (matriculant), according to the experiences of university lecturers, and according to tests conducted on first-year students (cf. MacGregor, 2009), and according to the admission of the Ministry of Basic Education (Meyer, 2010). The school environment revolves around the putting in place of an organisational culture, which is conducive to teaching and learning. A substantial body of literature on the theme of school effectiveness has evolved since Brookover and Rutter showed empirically in 1979 how schools can make a difference to the life opportunities of learners (Creemers & Kyriakides, 2008). In South Africa too, there are every year examples of how individual schools, in a sea of dysfunctional schools, can make a difference, as could be seen in the media during the announcement of the matric results (e.g. Moloi, Dzvimbo, Potgieter, Wolhuter & Van der Walt, 2010) as well as in scientific publications (such as Moloi et al., 2010). A comprehensive composite index on school effectivess does not exist; consequently, neither do internationally comparative data. The data on aspects of school effectiveness, which could be found, do not pass a favourable judgement on South African schools, as environments supportive of focused teaching and learning. For example, the most recently published PIRLS study, which involved 325,000 learners in 49 countries asked learners if they were subject to bullying at their schools. As many as 55 per cent of South African Grade 4 learners indicated that they are bullied at their schools on a weekly basis (Mullis, Martin, Foy & Drucker, 2012). That was the highest in the 49 participating countries. In Germany, England, and the state of Florida, for example, the figures were 16 per cent, 20 per cent and 19 per cent, respectively (Mullis et al., 2012). The teacher factor can be divided into knowledge, input and the methods of teaching employed by teachers. A fast (if somewhat unrefined method) of measuring the knowledge factor, is the duration of teacher-education programmes. South Africa and Namibia are the only two Sub-Saharan African countries where the present minimum education level of teachers (now in training) is a four-year university degree. After the Bologna Declaration (which harmonised higher education systems in the European Union), a five-year programme, culminating in a Master's Degree, is becoming the basic requirement for teacher-education programmes in Europe. A substantial percentage of South African teachers (still coming from previous dispensations of teacher education) would be undereducated, acccording to this criterion. According to Smith and Motivans' (2007) extensive comparative study on teacher quality in Sub-Saharan Africa, 26 per cent of South Africa's primary school teachers do not even have a Bachelor's degree. The duration of teacher-education programmes shoud not be seen in isolation; but, it is also important to take into account what teachers have learned and what knowledge they possess. Over the years, different models have been developed and published, regarding what type of knowledge teachers should have. The model of Schulman (1986, 1987) is widely regarded as being the most authoritative. An empirical validation of these models is hard to find. The Professional Competence of Teachers, Cognitively Activating Instruction for and Development of Students' Mathematical Literacy (COACTIV) project, using 2003/04 PISA study results, as well as the observation of teachers in Germany, was based on the model of Schulman (1986, 1987); and it investigated the correlation between the various forms of knowledge and the outcomes of mathematics teaching. This project reports very strong positive correlations, even that teachers' knowledge is a much better predictor of learners' achievement than the experience of teachers (Kunter, Baumert, Blum, Klussman, Krauss S & Neubrand 2011). This study was, however, limited to one country (Germany) and one subject (Mathematics). Secondly, there is the extensive research project at the King Saud Bin Saqr Al Qasimi Foundation of Policy Research, together with the American University in the United Arab Emirates. This project is about to commence; and it appears to be very promising for developing an internationally comparative index or database for this factor. The knowledge, which teachers possess, is not of value in the teaching-learning situation unless it is being employed. The input factor of the teacher is, therefore, the next significant factor. An indicator, which appears in UNESCO databases, and in the IEA studies, is the number of intended hours of instruction per year. The problem is that this indicator is of little value in cases where the de facto number of lesson hours differs from the de jure number. Allegations of large-scale absenteeism and the neglect of duty by South African teachers appear with regular frequency. Accurate empirical data are difficult to obtain; but in one published study by Steyn, Wolhuter & De Waal (2004) it was found that, on average 1.7 per cent of teachers at historically White schools are absent, and 15.5 per cent (rising to 25 per cent in extreme cases) of teachers at historically Black schools are absent on any given school day. According to the South African government's own admission, only three and a half hours of teaching takes place in historically Black schools compared with the six hours at historically White schools (Anon, 2009). As far as could be established, no scientific study has ever contradicted these statements. Education methods also comprise a factor about which consensus barely exists, and about which uncontested scientific evidence, as to best practice, is not available. There are also very few internationally comparable data on this aspect. Most IEA studies focus exclusively on achievements, i.a. the outcomes of the teaching-learning process. The single exception is the 2006 SITES study, in which South Africa compares in some respects surprisingly well with other participating countries. This study distinguished, on the basis of a factor analysis and the Cronbach alpha test between three didactic orientations, namely: the traditionally important orientation, the lifelong-learning orientation, and the connectedness orientation (Law & Chow, 2008). The traditionally important orientation is characterised by teaching practices, such as an examination-directedness (an exceptionally strong focus on learners achieving the highest possible results being a goal in itself) and to comply with the expectations of parents, society, etc. (Law & Chow, 2008). The lifelong learning orientation entails teaching practices, which should assist learners to learn from real-life examples/situations, a focus on the individual learning needs of learners, and to help learners to formulate their own learning objectives - and to plan, to learn, and to monitor themselves, accordingly (Law & Chow, 2008). Connectedness orientation is characterised by i.a. to offer learners the opportunity to learn from each other, and to guide them to use the internet in a responsible way, in order to learn from the web (Law & Chow, 2008). The last two orientations are probably better than the first. The lifelong orientation was found to be in 18 of the 21 countries stronger than in South Africa; but only in one country was the connectedness orientation stronger than that found in South Africa (Law & Chow, 2008). The traditional orientation, however, was stronger in South Africa than in all but two of the other countries (Law & Chow, 2008). The outcome of teaching-learning depends not only on the teacher factors, but also on the input of the learners. Only one international dataset measuring this factor could be found, namely the 2011 TIMSS study, which measured how many hours per week Grade 9 learners spend on homework in the subject of science. The results of South Africa compared with the averages of the 29 participating countries are reported in the study of Martin, Mullis, Foy and Stanco (2012) based on TIMSS data. Furthermore, for each of the three categories, the scores of South African learners are lower than those of the international average. For example, for those learners who spend more than three hours per week on science homework, the South African average test mark in the TIMSS science test was 308, compared with the international average (for learners who spend more than three hours per week on science homework) of 448 (Martin et al., 2012). The 2011 PIRLS and the 2011 TIMSS-results confirm the disconcerting picture of the output quality of South African education, which stemmed from the 2003 -TIMSS and the 2006-IEA PIRLS-test results (cf. Figure 3). South African Grade 4 learners who wrote the 2011 PIRLS test obtained an average score of 461 (Mullis et al., 2012). A total of 37 of the other countries which participated obtained higher scores, including two of the other upper middle-income countries which participated, namely Georgia (488) and Azerbajan (462) (Mullis et al., 2012). Only 12 countries obtained lower scores than South Africa, including two of the other upper middle-income countries, which participated, namely Colombia (448) and Botswana (419) (Mullis et al., 2012). In the 2011 TIMSS science test, South African learners obtained the second lowest score (332) of the 45 participating countries: only Ghana (306) was lower (Martin et al., 2012:44). All of the other eleven countries of category 5 of the 2011 international taxonomy (cf. Wolhuter, 2011b), which took part in the 2011 TIMSS study, obtained higher scores than South Africa: Honduras (369), Botswana (404), Georgia (404), Syria (426), Malaysia (426), Saudi Arabia (436), Armenia (437), Tunisia (439), Jordania (449), Thailand (451) and Iran (474) (cf. Wolhuter, 2011b). Singapore obtained the highest marks of all the participating countries (590) (cf. Wolhuter, 2011b). Personal rates of return constitute an index which is widely used, and about which there are data for many countries, although they are not in a central databank. Despite this, and despite the fact that there are various methods for calculating this index from very readily-available crude data (cf. Aslam, 2007), no publication could be found where this index has been calculated for South Africa. There do exist, however, a number of studies in which income levels and life opportunities for various categories of educationally qualified people have been calculated. A recently relased research report of the Centre for Development & Enterprise (2013), for example, found that unemployment among graduate South Africans is 5 per cent. Among South Africans with a post-matric qualification, other than a university degree, the percentage was 16%; among South Africans with matric, this was only 29 per cent; and among South Africans with less than twelve years of schooling, the percentage was 42 per cent. As explained above, Farrell (1982) distinguished in his model of equal educational opportunities between: equality in access, equality in survival, equality in output, and product equality. Ethnicity/race, gender, socio-economic status and geography were also identified in this study as being some of the main dimensions of educational inequality. While there has been much progress during the past years in equalisation along the racial dimension in South Africa, inequalities have by no means been entirely obliterated. This could be illustrated by means of the composition of the South African higher education student body, as presented in Table 3. However, on many other measures of equality, the inequality between the various population groups remain nevertheless huge. In the historically White schools in the Western Cape province, for example, 62 per cent of Grade 3 learners can read and write at the required level, but in schools in the Black townships in the province, the figure is only 3 per cent (Bloch, 2009). On gender equality in education and elsewhere, the most comprehensive and authoritative source is the annual gender equality report of the World Economic Forum (WEF). This report covers 135 countries (which between them contain more than 90 per cent of the global population). In its most recent report, the WEF appears in the 16 place (Hausmann, Tyson & Zahidi, 2012). The WEF calculates gender equality by means of a composite index, consisting of four categories of indicators, namely: economic participation and equality, educational equality, health and survival, and political empowerment. When educational equality (which in turn is calculated by means of a composite index of male-female enrolments on each of primary education, secondary education and higher education levels, and female literacy) is considered alone, South Africa falls into the 87th position (Hausmann, Tyson & Zahidi, 2012). With respect to product equality, the WEF report does not give any returns on education for males and females, but the WEF's index for equal pay for equal work between males and females for South Africa is 0.65 (if equal work could then be taken as a surrogate for equal educational qualifications). Theoretically, the value of this index could range from 0: complete inequality to perfect equality; and on this index, South Africa occupies the 71st place in the WEF's list of 135 countries (Hausmann, Tyson & Zahidi, 2012). Turning to the socio-economic status, the 2011 PIRLS study grouped learners, according to the availability of resources at their homes, into three groups: those with many resources at home; those with some resources at home; and those with few resources at home. The average test scores were calculated for each group of learners in each participating country. In the case of South Africa, the mean score for learners with few resources at home was 63 per cent of those with many resources at home (Mullis et al., 2012). This indicates considerable inequality in comparison with Lithuania (which, as is South Africa, an upper middle-income country); and more so, when a high-income territory, such as Francophone Belgium is considered. In the case of Lithuania and Francophone Belgium, the corresponding figures were, respectively, 81 per cent and 83 per cent (Mullis et al., 2012). Geographical inequalities between the nine provinces are evident from the most recent (2012) matriculation pass rates. For the respective provinces these were: Gauteng: 83.9 per cent; Western Cape: 82.8 per cent; Free State: 81.1 per cent; North West: 79.5 per cent; Northern Cape: 74.6 per cent; KwaZulu-Natal: 73.1 per cent; Mpumalanga: 70 per cent; Limpopo: 66.9 per cent and Eastern Cape: 61.6 per cent (Motshekga, 2013). The difference between Gauteng and the Eastern Cape is more than 20 percentage points. These statistics also confirm the existence of inequalities along the two geographical dimensions of urban-rural and core-periphery: provinces with a predomianantly urban population performing better than those with a predominantly rural population; and the pass rated declined with distance from the core (i.e. the two metropoles, Gauteng and Cape Town). In conclusion; firstly, a synopsis will be offered of the three component analyses made in the article. Secondly, some guidelines for the improvement of practice are suggested. To draw a synoptic picture; quantitatively, South Africa has made great progress during the past two decades at the level of pre-primary education enrolments. Primary and secondary school enrolment ratios are comparable to those of other upper middle-income countries; but the point of universal secondary school or even universal primary school attendance has not yet been achieved. With respect to higher education enrolment ratios, South Africa is trailing far behind other upper middle-income countries. On the qualitative dimension, the financial input in education is exceptionally high; but this input does not translate into quality in terms of physical facilities, the number of teachers supplied, and - above all - the expected outcomes; and it seems as if the weak links in the chain are the curriculum, the school environment, the input of teachers, and especially the adminsitrative subsystem. On the equality dimension, stark inequalities exist with respect to population groups, gender, socio-economic descent and geography. The problem areas of South African education, as has transpired from this study, could, therefore, be enumerated as follows: elusive universal secondary, and especially universal primary education, low higher education-enrolment ratios, the adminstrative underpinning of the education system, teacher input, the school environment and inequalities. In the light of the analysis reported in this article, the administrative substructure should be targeted. Rather than making the administrative subsystem bigger and more cumbersome, with new duties supervising the performance of schools, the administration should be made more efficient; further, the focus should shift towards the level of schools. As explained, the school environment is a significant determining factor of educational outcome. There exist some encouraging examples of schools rising above their unfavourable contexts. With the announcement of the matriculation results earlier this year, for example, the media reported enthusiastically on Park View Secondary School in the less-affluent residential area of Athlone in the Cape Town metropolis, which managed to raise its matriculation pass rate in one year from 18.9% to 74.4% (Fredericks, 2013). Under the encounragement of the Rector of the University of the Free State, a video series, Schools that Work, has been produced on the 10 best historically Black schools, which have succceeded in rising above their circumstances (cf. Blank, 2013). The theme of school effectiveness should figure more prominently in the South African Education research agenda. The administration of education, at central and provincial government levels should also become the subject of educational research, in view of indications that the administrative component hampers the education efforts in South Africa. The development of indices to evaluate the functioning of the administrative substructure, parallels of indices, such as gross enrolment ratios that are capable of measuring the quantitative dimension, would be very valuable in this regard. As was stated at the beginning of this article, measuring on the international spectrum is only one of three possible methods to evaluate the South African education system. Research on the other two methods - namely, against the stated objectives of the education system, and against the contextual imperatives, would be a valuable follow-up and complement to this research, and would ensure that education scholarships in South Africa could render their maximum contribution to the improvement of the South African education system. Bloch G 2009. A blueprint for learning. Sunday Times, 23 August:13. Centre for Development & Enterprise 2013. Graduate Unemployment in South Africa: A much exaggerated problem. Johannesburg: Centre for Development & Enterprise. Available at http://www.cde.org.za/images/pdf/GRADUATE%20UNEMPLOYMENT%20IN%20SOUTH%20AFRICA%20_A%20much%20exaggerated%20problem.pdf. Accessed 2 April 2014. World Bank 2012. World Development Indicators. Washington DC: The World Bank. Available at http://data.worldbank.org/sites/default/files/wdi-2012-ebook.pdf. Accessed 4 April 2014.